Fishing Equipment Fishing equipment consists of Shimano & Penn International 130's and 80's. Penn 50's and 30's on custom rods, fish finder, GPS/chart plotter, CB and VHF radios. 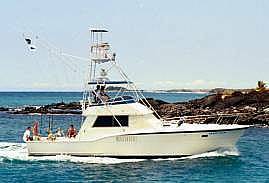 The "Grand Slam" is a 46 ft. (extended) Hatteras powered by two Cummins 903 turbo diesels. Air conditioned cabin with a couch and two stuffed chairs. Two rooms. Fully enclosed restroom facilities, full size refrigerator, large ice chest, TV, VCR & Stereo w/CD player.